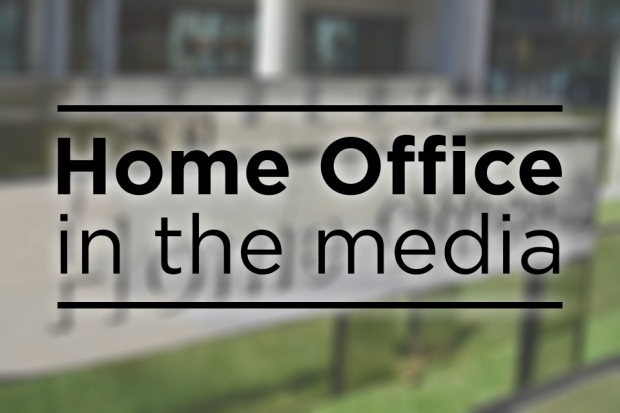 Today's Home Office stories include the reaction to yesterday's crime statistics publication, the Home Secretary and French Interior Minister's action plan on Channel migrants, and Jack Shepherd's arrest in Georgia. Widespread coverage is given to yesterday’s crime statistics publication, with the papers invariably leading on a substantial increase in violent crime. The Times reports that the murder rate is at its highest in a decade – up 14 per cent since 2008 – with urban areas such Merseyside, London and the West Midlands hit particularly hard. The Telegraph leads on statistics showing that knife crime is at the highest level on record, with Jason Harwin, the National Police Chiefs’ Council lead on drug crime claiming that “carrying a knife is the norm”. The Daily Mail carries the headline “Wild West Britain hit by 110 knife crimes a day”, with the increase attributed to a rise in county lines drug gangs. The Times’ analysis shows that while crime rises “are general small, they are high in harm and most likely to alarm the general public”. It adds that the real reasons behind the increases are not entirely clear – with county lines, lack of stop-and-search and drugs gangs each blamed. Today’s statistics show that your chance of being a victim of crime remains low. But we accept certain crimes, particularly violent crime, have increased and we are doing everything possible to reverse the trend. We have listened to police’s concerns about rising demand and have proposed the biggest increase in police funding since 2010. I’m confident the new settlement, which delivers up to £970m of additional public investment into policing in 2019/20, will help the police continue to recruit more officers. We know it’s also crucial to stop crime happening in the first place. This is why our Government’s Serious Violence Strategy emphasises intervening early and is working to prevent young people from being drawn into a life of crime. The Times, Telegraph, Independent, Mirror and Sun carry coverage of the Home Secretary’s talks with French Interior Minister Christophe Castaner on the English Channel migrant crisis yesterday. The Sun and Mirror led on the return to France of a small number of migrants in a bid to “deter future crossings”. The Telegraph and Times both reported that Mr Javid signed a new action plan – backed by £6 million of extra money from the Government – that would see a number of illegal migrants returned to France. The money will also be used for extra equipment – including night-vision goggles and CCTV – to combat Channel crossings. Widespread coverage is once again given to the case of Jack Shepherd – the convicted killer of speedboat victim Charlotte Brown. The majority of the coverage focuses on the fact Shepherd was free to live a lavish lifestyle while on the run in Georgia. The Times reports he did so despite Scotland Yard being aware of his location for up to six months. Beyond this, the Telegraph, Times, the Sun and Mail each carry details of a call between the Home Secretary and his Georgian counterpart in which he thanked Georgian authorities for their cooperation and “impressed the importance of justice being done as soon as possible”. The Mail splashed on the story that Shepherd is “paying £15,000 to lawyers fighting his extradition”. It adds analysis from British extradition lawyer Thomas Gardner, who said the process of returning Shepherd “may not be simple”. We are aware that Jack Shepherd is in police custody in Georgia. It is now for the Crown Prosecution Service to decide on whether to make an extradition request to the Georgian authorities, via the Home Office.